Arrangement of Silk Carnation and white mini flowers in wooden vase. It's her special night and you don't wanna go overboard but still want to surprise her, so here it is. 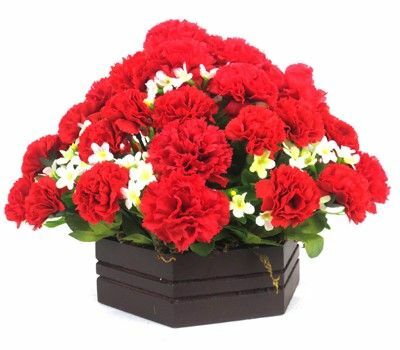 A beautiful silk vivernt red carnation with white silk mini flowers, nicely crafted in imported designer tin flowers vase, which compliments each other. Color : Red, Orange, Pink, Yellow, Material : Synthetic Cloths, Metal, Wood, PVC, Rubber Product Dimensions (LxBxH) : 8"x8"x8"